MINNEAPOLIS – For the briefest of moments inside U.S. Bank Stadium, it seemed like Virginia had lost. That the magical ride was over. Kyle Guy’s corner 3-point attempt clanged off the rim as Auburn fans erupted from the other end, believing a 62-60 victory had been sealed. The noise concealed an immediate whistle on Guy’s shot attempt, however, so with 0.6 of a second left, he stepped to the line with Virginia’s fate in his hands. One. Two. Three. 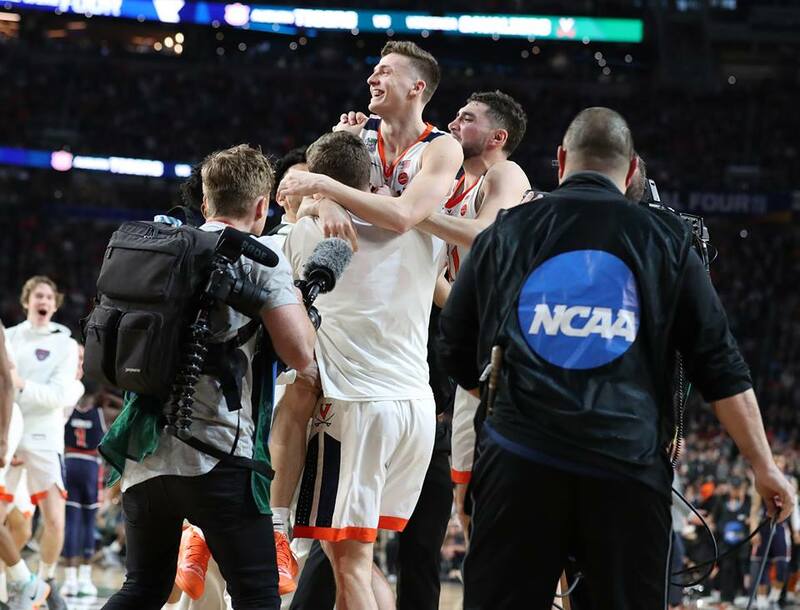 Guy knocked down all three free throws in front of 72,711 fans and lifted UVA into the National Championship game with a 63-62 win against Auburn. Moments earlier Guy kept hopes alive for Virginia when he hit a contested 3-pointer in the opposite corner to cut a four-point deficit to 61-60. Before that crowded attempt found its way in with 6.5 seconds to go, Guy had made just 1 of 5 3-point attempts on the night. 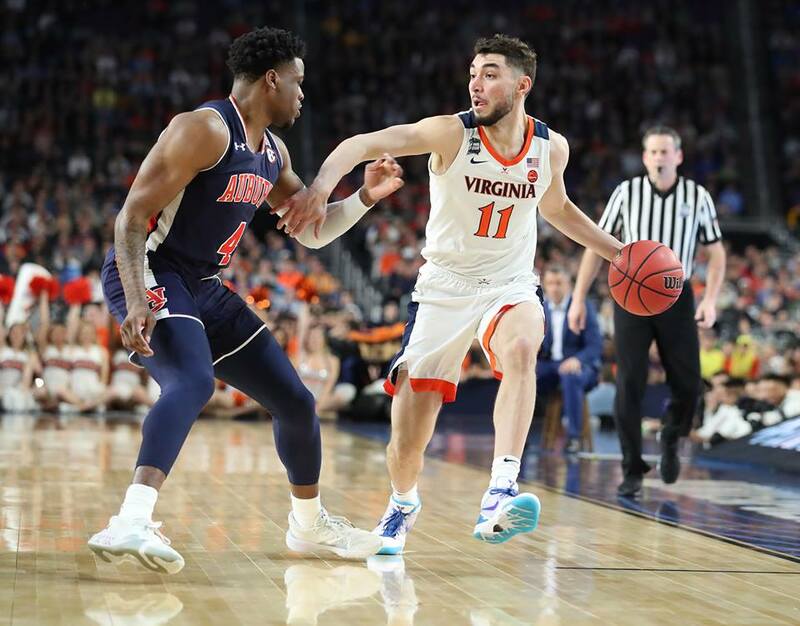 On the ensuing inbounds attempt, Kihei Clark fouled Auburn’s Jared Harper to extend the game and when Harper made just one free throw, the door remained open for a UVA win in regulation. After Auburn intentionally stopped the clock with a couple of fouls to give, the Cavaliers set up that final inbounds play from the side and Guy caught it in the corner with a look at the rim. Auburn’s Samir Doughty tried to contest the shot but stay away from Guy with his upper body, but his lower body drifted into Guy’s hips and the official immediately blew the whistle for the foul call. Guy delivered the three free throws to end it after Auburn’s desperation heave didn’t find its mark. Indeed, Virginia and Auburn both battled fiercely on the Final Four stage. The lead changed hands 13 times and the game featured five ties as well. UVA committed just 8 turnovers against the Tigers, who led the nation in opponent turnovers per possession this season. Auburn, meanwhile, made a run to the semifinals with some strong 3-point shooting, but broke through Virginia’s Pack Line scheme for shots near the rim along with 9 3’s. Ultimately, the back-and-forth affair came down to two huge runs in the final 10 minutes and those clutch points late from Guy. First, the Cavaliers appeared to break open what had been a close contest most of the way. The Hoos uncorked a 13-4 run over 4:29 to turn a one-point lead into a 57-47 advantage with 5:22 remaining. Kihei Clark started the surge with a corner 3-pointer and Ty Jerome followed on the next trip with a 3 of his own. Jerome made a tough leaner to beat the shot clock near the 6:46 mark before De’Andre Hunter drove for a bucket just inside of 6:00. When Jerome blocked a shot and then hit another 3-pointer on the next two possessions, UVA had its largest lead at 10 points. The Tigers were reeling, but they weren’t done. Following a Pearl timeout, Auburn responded with a 14-0 burst to take a 61-57 lead with 17.6 seconds remaining. Bryce Brown hit a trio of 3-pointers to ignite the rally and Afernee McLemore’s free throws appeared to put the game on ice. The Hoos, however, stayed the course. They brought Guy off a screen for that tough corner 3-pointer. Jerome got the defensive rebound on Auburn’s missed free throw. UVA played through the Tigers two fouls to give and through non-calls on a jersey grab by Auburn and the resulting double dribble on Jerome. Then Virginia executed out of the timeout to get that final look. Auburn placed three players in double figures. Doughty led his team with 13 points and 5 rebounds, while Brown posted 12 points, 3 rebounds, and 3 assists. Harper chipped in 11 points and 3 assists. McLemore had 9 points and 12 rebounds. The Tigers shot just 38.2% for the game, including 34.6% in the second half. They made 9 of 31 triples for 29.0% shooting behind the line. Guy’s final free throws pushed his total to 15 points on the night with 4 assists. Jerome led all scorers with 21 points and added 9 rebounds with 6 assists too. The Cavaliers had to play without him for a short stint late in the second half when he picked up his fourth foul out of frustration that he called a “bonehead play” afterward. Hunter, the third amigo, finished with 14 points, 5 rebounds, 2 assists, and 2 blocked shots. Virginia also got 9 points and 3 assists from Clark, while Mamadi Diakite posted 6 rebounds and a career-high 5 blocked shots. The Cavaliers shot 49.0% for the game, including 56.5% in the second half. They made 7 of 19 3-point attempts for 36.8%. All of that was needed obviously to pull out the thrilling victory with drama in a final second for the second straight game. Virginia will play for the National Championship on Monday night against Texas Tech. It’s the first title game appearance for both programs. For the Hoos, it’s also a chance to finish off an incredible turnaround story. One year after losing to UMBC as the first No. 1 seed to ever lose to a No. 16 seed, the Cavaliers could win their first National Championship. They’ve answered questions about it for more than a year, but the opportunity for a legendary comeback story is now officially on the table.